If you’ve noticed that chowing down on packaged foods or meals from chain restaurants just leaves you hungry, you’re not alone. Most of the “diet” foods we eat today, and certainly the meals you find at fast food restaurants, are designed to be as addictive as possible to keep you coming back for more. Adding cheap sweeteners, salt and fat to processed foods is trickery that masks low-quality ingredients. Eating this food distorts your appetite and causes you to consume more calories than you require. Even more devastating, most food from packages and chain restaurants are built around high-glycemic carbohydrates that produce a rapid increase in blood sugar levels. 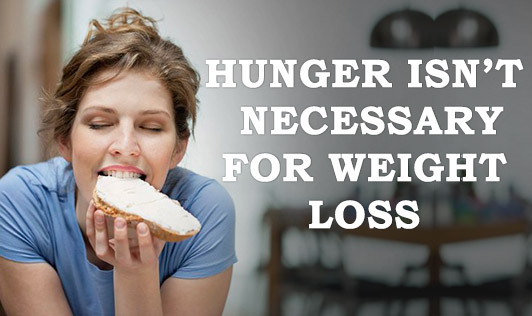 This results in a delayed hunger surge that pushes you to eat more calories in your next meal. There’s a better way to lose fat than by starving yourself. Just because something is gluten-free, sugar-free or dairy-free doesn’t make it good for you. In fact, most products with the marketing claims I just mentioned are low-quality processed foods disguised as health foods. Losing fat while feeling full has more to do with filling up on the right things, rather than simply avoiding the junk. Have you ever noticed how easy it is to eat a whole bag of potato chips, box of crackers, or even an entire pizza in one sitting? Or, you know, those dinky 100-calorie packs of crackers, cookies or chips? When you get to the end of the bag (probably in about five seconds flat), you want another one, don’t you? But how many times have you eaten a big, juicy apple (usually about 100 calories, by the way) and said, “Golly, I really want another apple right now”? Never. Your brain knows real food when you encounter it. When you are hungry, your body doesn’t necessarily want food, it wants nutrition. If you feed it foods that are nutrient-poor, your brain and body will never really feel totally satisfied. The key is to feed yourself real and fresh whole foods that are high in nutrients and satiate your hunger. Over hundreds of thousands of years, the forces of natural selection tweaked and perfected your physiology to function optimally on a diet consisting mainly of wild plants and animals — vegetables, meat, and occasional fruits, nuts, and seeds — which are naturally high in fat, protein, and fiber and low in carbohydrates. Since the advent of agriculture and especially industrial food processing, we have become carbohydrate-eaters. But because we simply are not built to handle the massive amount of carbohydrates in the foods we eat today, our bodies readily converts them to sugar to be stored as fat. Restriction is commonly associated with weight loss. It’s almost assumed you have to tolerate these feelings if you want to lose weight. This excess restriction does nothing but suppresses your desire to eat until the feelings are no longer bearable.